New restaurants to open this month at City Walk, Menchie’s Open now! This month is a huge month for Universal Studios City Walk! As this area undergoes a ton of changes and reinventions, three new restaurants will be opening! Menchie’s is now open at City Walk, and later this month, Hot Dog Hall of Fame and VIVO Italian Kitchen will be opening! I know we cannot wait to try out these new restaurants! This is what Universal Studios Florida had to say about the expansion! Menchie’s is now open and is located on the second floor promenade of CityWalk. 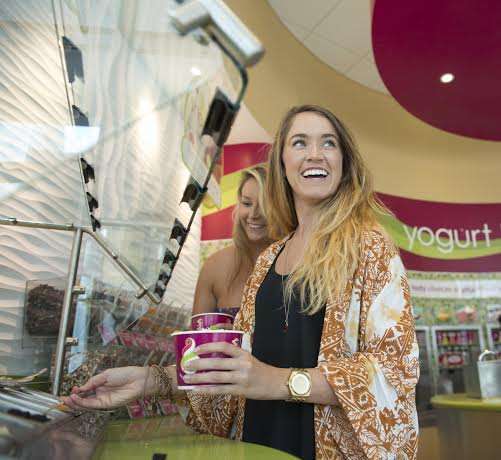 This popular frozen yogurt shop provides guests a unique and fun frozen yogurt experience with an expansive, self-serve toppings bar that is guaranteed to make guests smile. Later this month, Hot Dog Hall of Fame and VIVO Italian Kitchen, will join the CityWalk line-up. Hot Dog Hall of Fame, located across from Antojitos Authentic Mexican Food on the second level of CityWalk, will feature iconic hot dog creations from some of our nation’s most famous ball parks, including the loaded Chicago dog and Boston brat. Universal exclusively partnered with Steven Schussler, the global culinary concept creator behind the popular Rain Forest Cafe, to bring his Hot Dog Hall of Fame concept to CityWalk. Located on the ground floor next to Red Oven Pizza Bakery, VIVO Italian Kitchen will immerse guests in the essence of modern Italian cuisine. This original concept restaurant will showcase a contemporary dining atmosphere, allowing guests to watch chefs handcraft pasta from scratch and create classic Italian dishes with a modern twist. Menchie’s, Hot Dog Hall of Fame and VIVO Italian Kitchen join Red Oven Pizza Bakery, Antojitos Authentic Mexican Food, Cold Stone Creamery and Starbucks as the latest establishments to open as part of the expansion to Universal CityWalk. Other venues will open later this year. For more information about Universal CityWalk, visit: https://www.universalorlando.com.